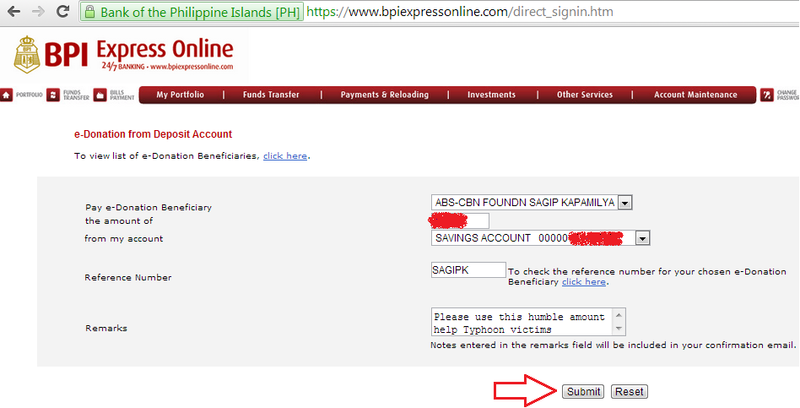 Filipino Investor: How to Donate in ABS-CBN Sagip Kapamilya Through BPI ExpressOnline? 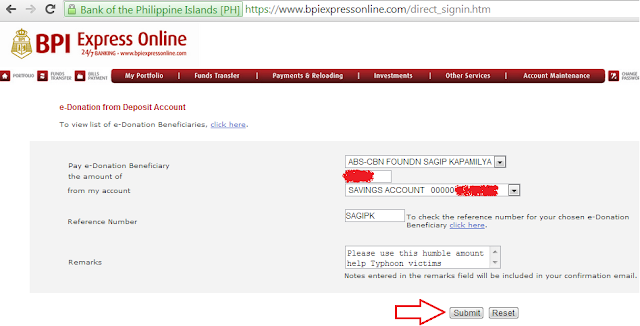 How to Donate in ABS-CBN Sagip Kapamilya Through BPI ExpressOnline? And we at The Filipino Investor ask, what better time to share than now? Below are the easy steps to donate in ABS-CBN Sagip Kapamilya through BPI Express Online. Step 3. Fill out the forms! Once the transaction is completed and successful you will be navigated into a confirmation page with the summary of your transaction. Your donation is finally completed! It is no secret that our fellow Filipinos in the areas hit by Super Typhoon Yolanda is in a very bad shape. Any amount of help will make their life at-least a little easier.